RIDGEFIELD,Conn. (WTNH) - It was a Saturday morning when families were gathered at the baseball field at Ridgefield High School. When the fire started burning, someone left the field and ran across the street to the police department. "It had rained the night before there was a scheduled baseball game," explained Captain Shawn Platt. Someone thought it would be a good idea to warm the field in time for Ridgefield and Amity Regional to play ball. 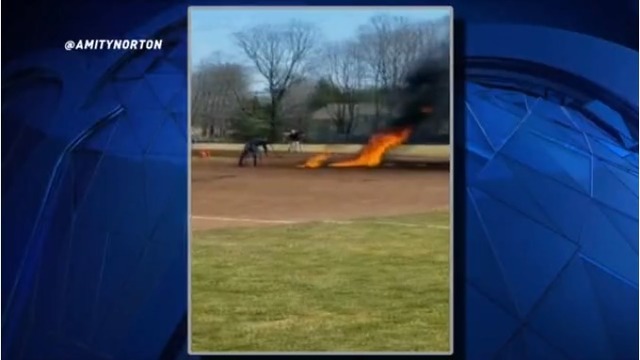 Video was shot by a teacher showing the moment after 24 gallons of gasoline were poured on the infield and set on fire. "We're not sure. It's an active investigation of who instructed, if anybody instructed," Capt. Platt said. Authorities were notified immediately, and the Connecticut Department of Energy and Environmental Protection's hazmat group was called. Gasoline-soaked soil had to be tested and removed. It's a process that will cost the town thousands of dollars. Police haven't said whether anyone will be facing charges. They do hope to wrap up their investigation this week. Neighbors are wondering why it happened in the first place. "By now, everybody knows you don't pour gasoline on the soil. You think everybody knows," Phil from Ridgefield said. "I get it to a certain degree, but at the end of the day, the decision was not well thought out," Evan Schreiber of New York said. Officials said the field will be closed for the remainder of the week as they do soil testing.